If you’re running containers at scale, you are most likely either already using a container orchestration tool or are in the process of deliberating which one to use. To be able to build and run hundreds of containers, a management layer on top of your Docker hosts is necessary to be able to orchestrate the launching, scaling and updating of your containers efficiently. Docker Swarm is Docker’s built-in orchestration service. Included in the Docker Engine since version 1.12, Docker Swarm allows you to natively manage a cluster of Docker Engines, easily create a “swarm” of Docker hosts, deploy application services to this swarm, and manage the swarm’s behavior. 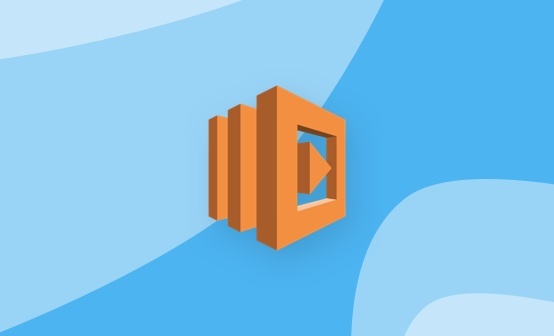 Logging in Swarm mode is not that different than logging in a “non-swarm” mode — container logs are written to stdout and stderr and can be collected using any of the logging drivers or log routers available. 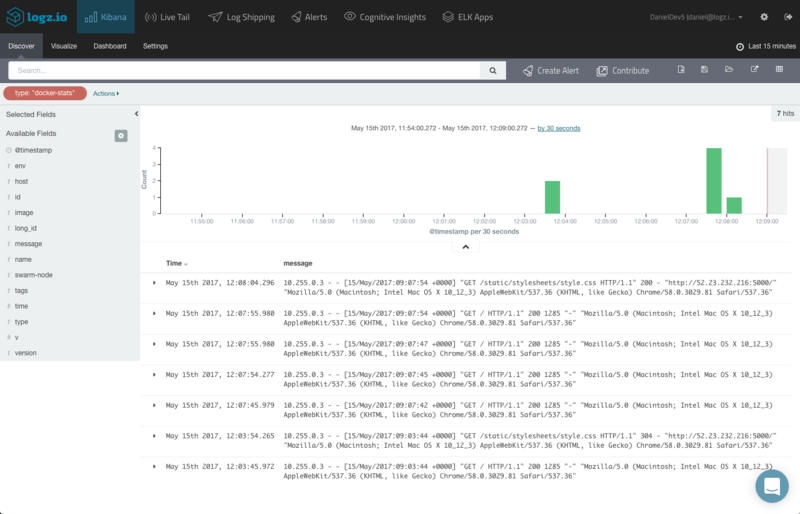 If you’re using the ELK Stack for centralized logging, you can use any of the methods outlined in this article. 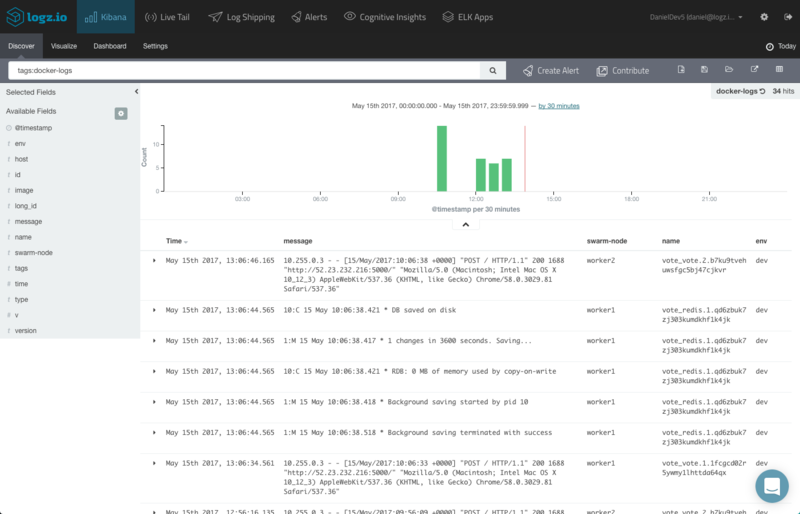 The Logz.io Docker Log Collector is a good option to use in Docker Swarm since it allows you to get a comprehensive picture of your swarm by a) providing three layers of information from your Docker nodes — container logs, daemon events and Docker stats from your hosts and b) allowing you to monitor cluster activity and performance using environment variables. If you already have Docker Swarm set up with running services, you can skip the following two sections that explain how to setup Docker Swarm and install a demo app. To create a Docker Swarm, I created three different Docker hosts — one to act as a manager node and the two others as workers. Swarm initialized: current node (dxn1zf6l61qsb1josjja83ngz) is now a manager. To add a worker to this swarm, run the following command: docker swarm join \ --token \ :2377 To add a manager to this swarm, run 'docker swarm join-token manager' and follow the instructions. The –advertise-addr flag configures the manager host to publish its address as , so before continuing on verify that the other nodes in the swarm are able to access the manager at this specific IP address. docker swarm join \ --token \ :2377 This node joined a swarm as a worker. 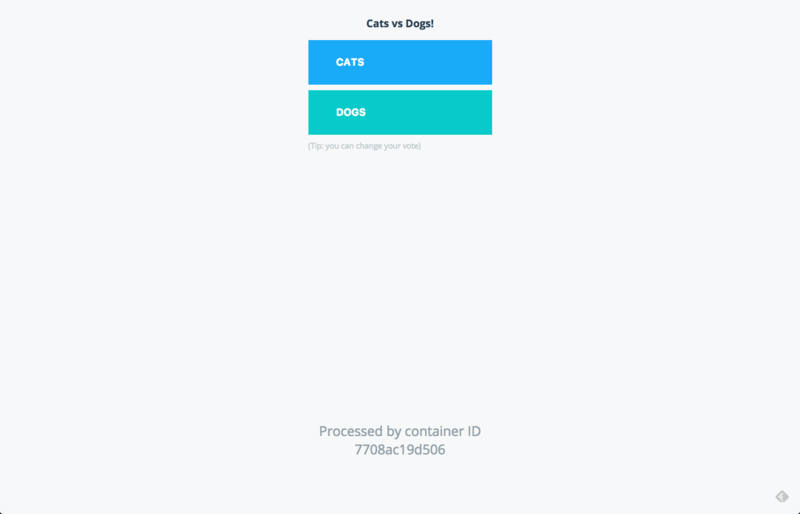 Now that we have a Docker Swarm set up, we’re going to deploy the sample voting app on it. Within a few seconds you will have multiple services up and running, and replicated as defined in the application’s docker-stack.yml file. To take a look at the app, access it using port 5000 on ANY of the cluster nodes. 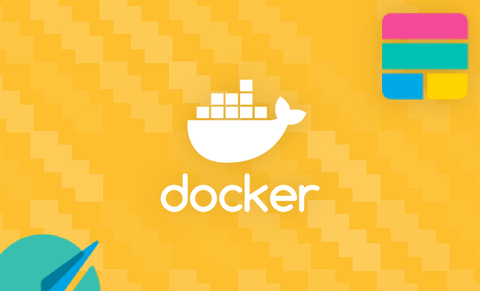 Our next step is to run the Docker log collector. 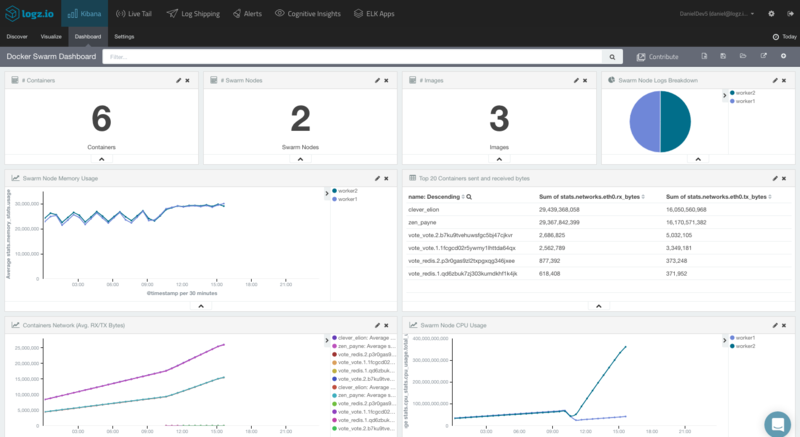 Wrapping docker-loghose and docker-stats, and running as a separate container per Docker host, the log collector fetches logs and monitors stats from your Docker environment and ships them to the Logz.io ELK Stack. Using the -a flag, we can add any number of labels to the data coming in from the containers. In Docker Swarm, we can use this option to add the name or ID of the cluster node. Repeat this command for the other cluster nodes. Within a few minutes, you will have data streaming into the Logz.io ELK Stack. 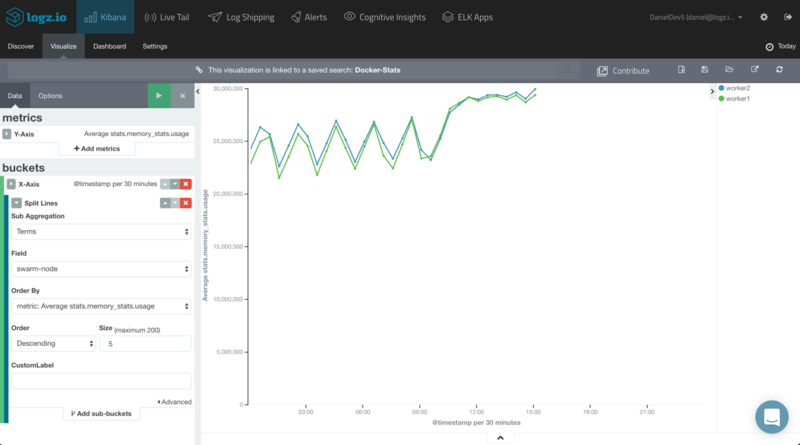 To help you begin analyzing the data being shipped from your Docker Swarm, here are a few tips and tricks. 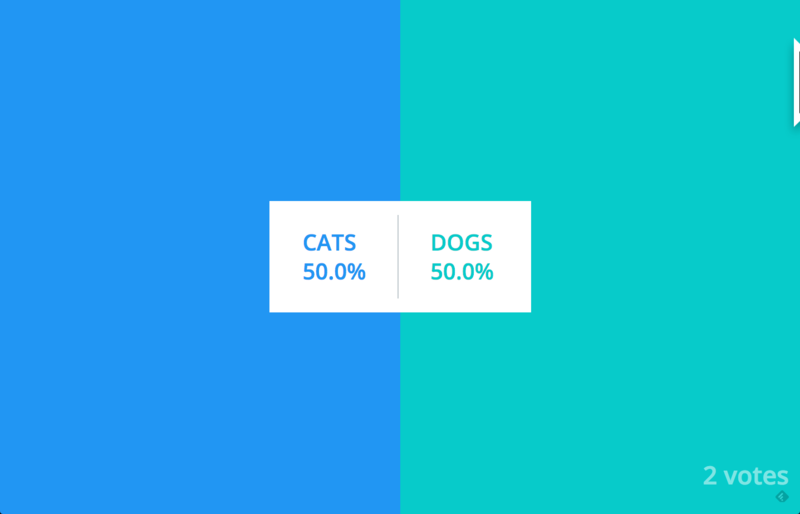 First, decide which type of data you wish to focus on. Select some of the fields from the list of available fields on the left. This will give you some visibility into the data being displayed in the main viewing area. For example, add the ‘swarm-node’, ‘name’ and ‘env’ fields. Our last and final step in this article is to visualize the data coming from our Swarm nodes. 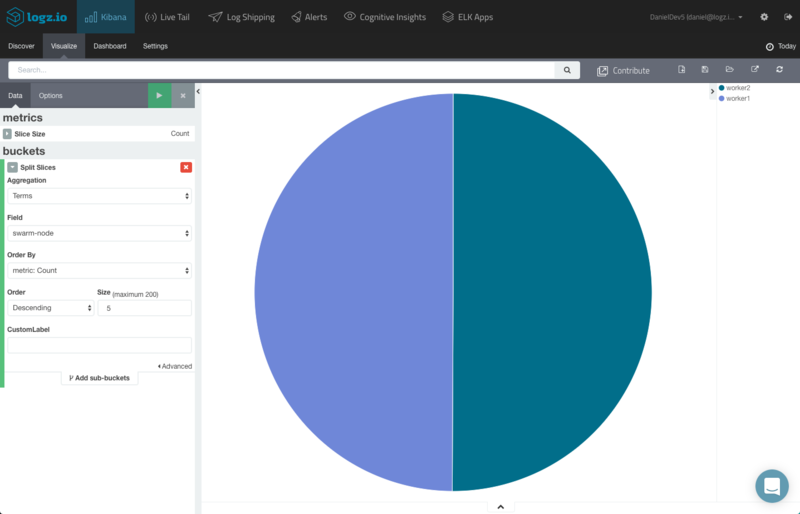 Kibana is renown for its visualization capabilities and the sky’s the limit with what you can do with your data. 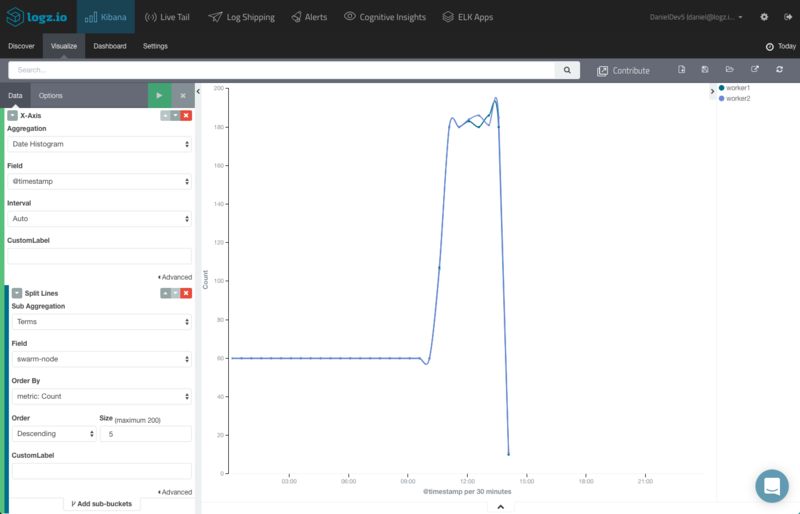 While the methodology for logging in a Docker Swarm mode does not differ from logging in a regular Docker environment, analysis and visualization can vary based on node data we decide to ship with the logs. The Logz.io log collector makes this pretty easy to do. Use Logz.io's Docker Log Collector to Ship your Container Logs. 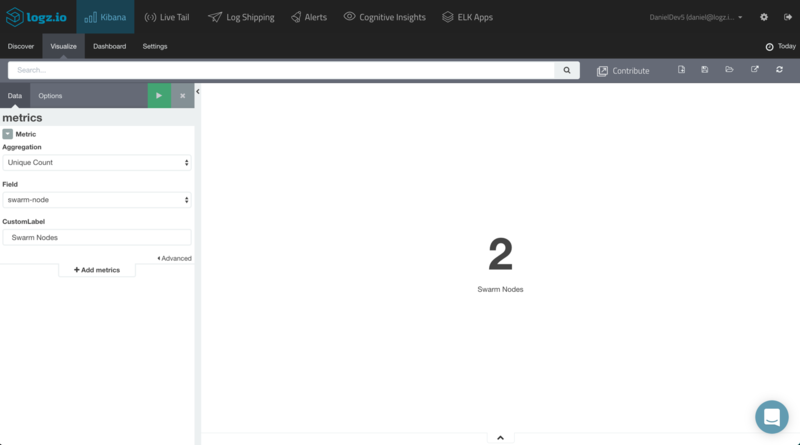 Easily Configure and Ship Logs!